Final versions of these papers, along with the target article, will appear in the March 2019 volume of Language in the Perspectives section. Iris Berent and Gary Marcus. No integration without structured representations: reply to Pater. Ewan Dunbar. Generative grammar, neural networks, and the implementational mapping problem. Tal Linzen. What can linguistics and deep learning contribute to each other? Lisa Pearl. Fusion is great, and interpretable fusion could be exciting for theory generation. Jonathan Rawski and Jeff Heinz. No Free Lunch in Linguistics or Machine Learning. This entry was posted in Uncategorized on October 6, 2018 by Joe Pater. By Steve Holy with slight additions and edits by Joe Pater. Corrects some inaccuracies from http://blogs.umass.edu/pater/2016/08/18/learning-to-rock-with-gord-in-the-slinks/, which were unfortunately promulgated in a recent book on the Hip. Ethier, Hetherington, McQuaide and Pater took the stage at the KCVI dance during the hired band’s break. Downie hitchikes through Nova Scotia with Paul Langlois, returns reporting Langlois has written some original songs. The Jim Jones Band also played an undated show at the Holiday Inn, and Ethier/McQuaide/Pater played an undated talent show at the Lakeview Manor. Fall 1982: 5-piece Slinks play the Kingston Yacht Club, and the KCVI dance (partial song list and photos here). 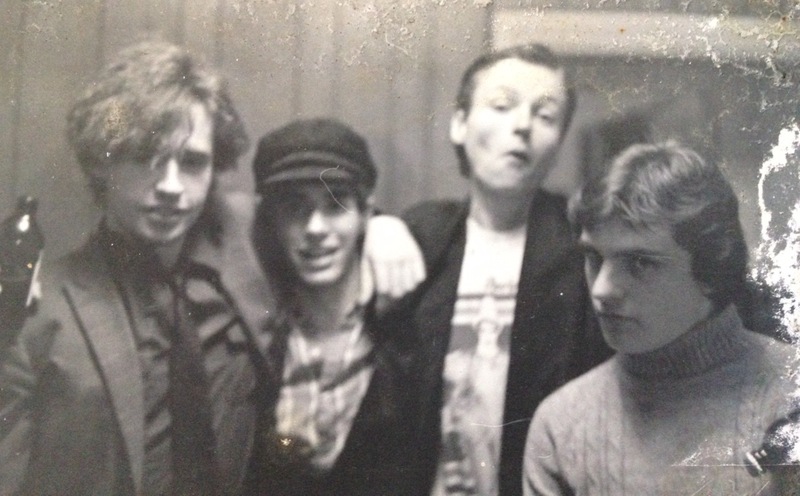 Spring 1983: Frontini (guitar) and Pater (bass) play in Hugh Dillon’s class project video with Ian Goodfellow (drums). Iggy Pop’s I’m Bored was one of the songs. Ethier and Holy tour Eastern Ontario with The Rattlers (also Hugh Dillon and Tim Given). Disband early 1985. This entry was posted in Uncategorized on May 20, 2018 by Joe Pater. This entry was posted in Uncategorized on November 5, 2017 by Joe Pater. This entry was posted in Uncategorized on August 7, 2017 by Joe Pater. Growing up in Kingston, Ontario in the early 80s, and in particular going to high school at Kingston Collegiate and Vocational Institute at that time, I was surrounded by a lot of musical talent. Like the four guys who I was lucky enough to play in my first band with: Gord Downie, Grant Ethier, Andrew Frontini, and Steve Holy, the Slinks. I snuck into the band by virtue of playing passable blues harp. They had been playing for a while already, with a focus on Teenage Head covers (“Lucy Potato” inspired my nickname “Joey Potato”), and decided to take a blues direction so brought me in on the harmonica. I could also play a little bit of guitar and keyboards, but I essentially had to learn those on the job, to sometimes passable results (especially on guitar), and sometimes not (especially on keyboards). The Slinks, KCVI gymnasium, from the 82-83 Yearbook (L-R Steve Holy, Gord Downie, Grant Ethier, Joe Pater). Photo by Lisa Samuda, thanks to Peter Hendra for the scan. We never did go very deep into the blues, for some reason. I know my own music listening had already transitioned from Howlin’ Wolf and Muddy Waters to Funkadelic and Iggy and the Stooges. My big harp numbers were the Stones Midnight Rambler and the Doors Roadhouse Blues, though I think we did also do Messing with the Kid by Junior Wells. We did a couple songs from the Bowie/Iggy catalog that had a heavy Stones influence and so worked well with especially how Steve played guitar, and probably also with how Gord sang, though I wish in retrospect that I’d pushed for the Stooges, which I’m sure they would have both done a great job with. We probably thought those songs wouldn’t have worked with our other material, or maybe that people would think they were too weird (some other friends – pictured here – and I used to bring Raw Power to parties with the thought that we’d disrupt the proceedings in a suitably punk way). The Bowie song was Watch that Man, which was undoubtedly a source of a lot of learning for both Gord and me. I remember clearly sitting in the backyard with my Tele, working on memorizing all of those chord changes, and I also remember the satisfaction of getting through it on stage. I learned how to sing it myself last year, and discovered that it’s incredibly hard – the vocals come in with key changes, and it’s way out of my range – I had to bring it down a fifth. I wrote to Gord about it, and he told me that the Hip had played it in an encore on a tour when they were learning a new song each night – impressive in light of my struggles with that song, but I guess that’s the sort of thing you can do when you get as good as they are. The Stonesy Iggy song the Slinks played was Consolation Prizes, which was one of my favorite Slinks songs – I can still hear Steve playing the James Williamson Mick Taylor ripoff slide part. More Slinks at the KC dance: Andrew Frontini and Gord Downie. (Thanks Andrew for the the photo, again originally published in the yearbook; photo credit Lisa Samuda). I only remember a few other songs that we played. There was some definitely some Clash – London Calling and Brand New Cadillac. One that sticks out in my mind is Rick James’ Super Freak – it must have been hilarious hearing Gord sing that, with me playing a cheezy synth part. 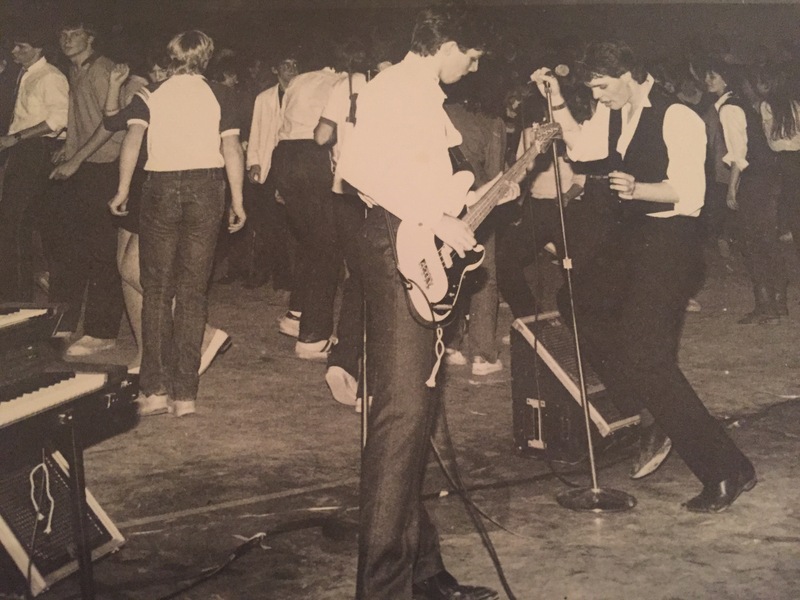 Another one that I remember well is the version of Sweet Jane from Lou Reed’s Rock and Roll Animal, which we played as our big first number for our biggest gig, a high school dance in the KCVI gym. It has a ridiculously complicated intro part, the mastering of which was our biggest musical accomplishment. When the chords for the actual song kicked in, Gord made his entrance. Even if it wasn’t the Stooges, it was still pushing the boundaries for a high school dance. The other shows I remember are our first one, at the Yacht club (the Slinks also played there without me), and our last one, at the Polish Hall. I have only the vaguest memory of an outdoor show on a farm, but I think it might have been pretty great. We never realized our grandest ambition, which was to play one of the bars in town. 15-to-17-year-olds tend to have a hard time convincing bar owners to give them gigs. I saw Gord some years later at the Polish Hall, for Paul Langlois’ stag. I remarked that it was funny that that was the site of the last Slinks show, and he said, “Yeah, right before I was kicked out of the band.” I actually can’t remember why we decided to break up at that point – I think it was because we were generally tired of the teenaged band drama, and we hadn’t really found a common musical mission. One big mystery to me is why we never tried to write anything – if we had, maybe we would have found something we wanted to keep pushing at. I think it simply never crossed our minds that we could write music together. 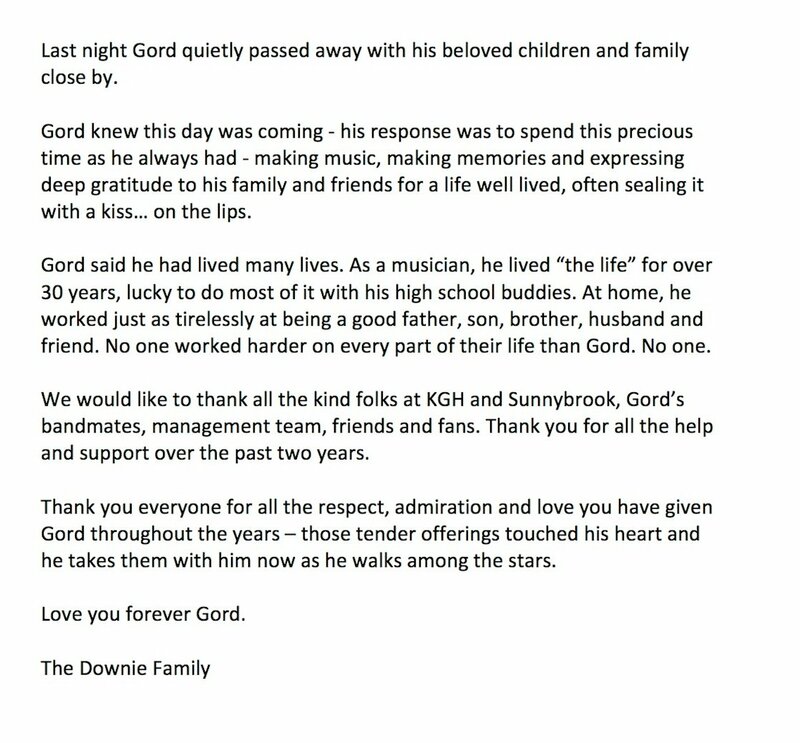 Gord probably perceived the breakup as him being kicked out because the rest of the band did in fact play a show shortly thereafter, but with another singer, as well as another guitar player. We called ourselves the Jim Jones Band, and played the Lake Ontario Park country talent show, with a rockabilly version of Iggy’s Dog Food, and a pornographic version of Rod Stewart’s Hot Legs, during which we were unplugged. That was our only show, but it was a highlight of my musical “career”. As great as that one show was, I’m pretty sure we didn’t break up the Slinks to do it, but who knows. maybe we were stupid enough to kick Gord out of our band. In the big picture though, the teenage drama was completely eclipsed by the the fact that we were living out our teenage dreams of playing in a band (at a high school dance! ), and getting that rush for the first time that you can only get playing music with other people, especially in front of an audience. I’ve had plenty of flashbacks over the years to my parents’ basement where we rehearsed and where I learned the art of rock and roll, and I know I’m not the only one. The Slinks all went on to bigger things musically. Steve moved on to jazz guitar, and then to bass, and he’s now a mainstay of the Vancouver jazz scene. Andrew became an architect, but has always had musical projects on the go in Toronto (Quadruped and others). And Grant was in the Thirteen Engines and the HellBillies, and ran the Funhouse, a recording studio that was at the center of a thriving Kingston music scene in the early 90s that I got to be a part of in a band that I played in over a few summers in Kingston, Hungry Tim. I got to realize our bar gig dream not too long after the Slinks split up – I did a couple shows there with some of the Slinks and some other friends at the Terrapin (now the Toucan), which was the site of many of Hip’s early shows. And some time after that, I even got to play the Horseshoe in Toronto with Hungry Tim, thanks to Gord. I’ve kept at it sporadically over the years (here’s my best recent song), and in many ways, I’m still the same person I became in that basement. I’ve got my own basement studio in a red brick house with a noise-tolerant family in another small college town with a proud rock history and thriving music scene. Most recently, I did a couple shows that would have made teenage me extremely proud – we got a Bowie tribute together in January, as well as a Stooges set a couple months later. And I even got to be the singer, which entailed a whole lot of learning (cramming, even). What Gord managed to accomplish with the Hip artistically, commercially, and culturally is way beyond anything that we could have possibly dreamt of as teenagers. I’m heading back to Kingston this weekend to watch the Hip play the last show of what might be their last tour. Even though it’s hard to come to grips with the fact that Gord’s very sick, it’s beautiful to see him continuing to do what he loves to and has become so, so good at. He has developed his voice into a really fantastic instrument. I particularly like the high register that I think I first heard on Bobcaygeon, and which he says served him well for the Hip’s take on Watch that Man. Like me, Gord was learning on the job in the Slinks – though he did have a natural stage presence. He’s come as far as he has by working really hard. And he’s also become a great songwriter (hearing Bobcaygeon for the first time was also the moment I said to myself that Gord had become a great writer). This also takes tons of work, which he didn’t start doing, as far as I know, until he joined the Hip. I know that when I fantasize about what I’d do if I knew my days were particularly limited, I imagine quitting my job and putting myself full time into making music. I don’t know if I’d really have the courage or tenacity to do that, since I didn’t have it when I was younger, which is why it’s so inspiring that Gord always has had it, and still does now. I also see he was in the tribute business too, with a Lou Reed cover after his death. Update May 12, 2018 Photo credits added. Update May 20, 2018 Steve Holy has a better memory than me! Turns out the Jim Jones Band show happened before, rather than after, the Slinks shows I played with Gord, and that the farm show was the Filters, not the Slinks. A full Slinks chronology is here. This entry was posted in Uncategorized on August 18, 2016 by Joe Pater. The RPM Challenge asks us to write and record 10 songs during the month of February. I’m using this page to document my attempt to meet that challenge, as well as to facilitate collaboration, should anyone decide they want to help me out on this. I feel like I’m off to a good start. I figured one way that I might be able to write 10 songs in a month is if I use a drum machine and record a guitar part for each song, and then fill in the rest over time (and maybe replace those later, especially the drum machine, especially if a drummer happens to want to work on this with me). I have a KR-mini that I bought for jamming and that hasn’t gotten much use, but I think it’s going to be pretty perfect for this. Tonight’s song features the Metal-1 and Pop-1 and Pop-2 beats. I happened to get a pickup installed in my acoustic recently, and it’s sounding excellent through the speaker emulation / DI of my Marshall. Biggest revelation tonight – the nasty ground loop that I’ve never been able to pin down goes away when I unplug the laptop that I’m recording onto! Luckily there’s a sound booth across from my office, so I got to get some scratch vocals done. Note to self – remember to close the sound booth door in the future! Found another beat on the KR-Mini that I liked, but technical glitches plagued by attempts to do anything with it, and all I wound up with was this not particularly original Roxy Music-like progression. This entry was posted in Uncategorized on February 1, 2016 by Joe Pater. I had been intending to write up some thoughts on Blackstar, Bowie’s new album that was just released on his 69th birthday Friday, and on what has been a Bowie year for me over the last twelve months or so, when I got the news of his death. I don’t really want to write about Blackstar, though I am listening to it again right now (I think it’s great, though not as great or revolutionary as some writers have said). But I do want to write a letter of thanks to David Bowie for everything he gave us. He’s been a particularly huge influence on me this year, and at the risk of seeming self-focused, I’ll structure this tribute around that (insomuch as this is going to have much structure – there’s quite a bit of rambling and digression ahead). My Bowie year started Christmas 2014. I happened across Chris O’Leary’s phenomenal blog, Pushing Ahead of the Dame: David Bowie, song by song. Getting the context for the music in such detail, especially about Bowie’s songwriting process, the musicians involved, its recording made me re-listen to it all with new ears. By “all”, I mean the albums up to and including Scary Monsters – nothing later than that has ever made much of an impression on me, until the last two. Maybe that’s because these were the albums I listened to as a teenager – Scary Monsters was one of the first CDs I ever heard (thanks Dad!). I got into Bowie thanks to my buddy Marc Lafrenière. He’s second from right with a Bowie-esque haircut, wearing a Scary Monsters t-shirt. A couple points on the Lou and Iggy collaborations while we’re here. 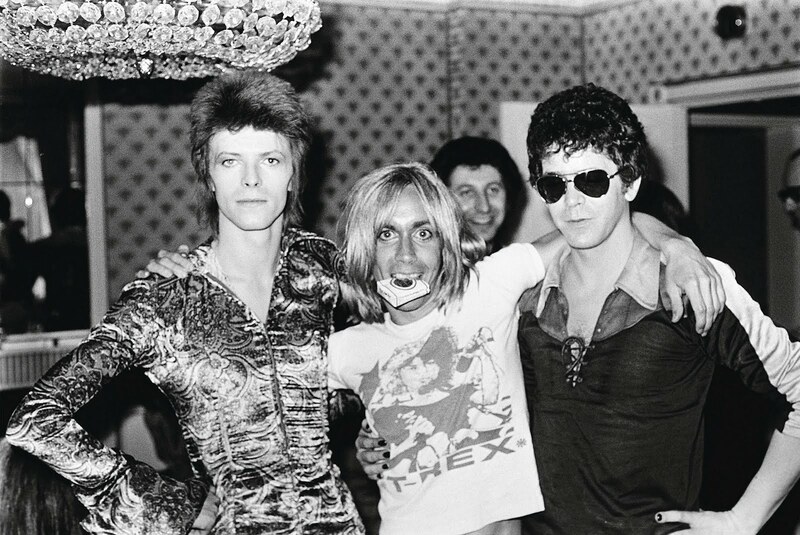 Bowie was hugely influenced by both of them – Ziggy was in some ways Iggy, and David was covering VU songs as he made the transition from spacy folk hippy to avant guard rocker. He then paid them back by helping them make some great music, and make some money. David played sideman to Iggy on a tour, and there is a phenomenal clip of them on the Dinah Shore show available on YouTube: both the performances and interview are must-sees. On Lou and David, I have to mention this making-of Transformer film I watched on Netflix, in which Lou rhapsodizes about the genius of Bowie’s backing vocals on Satellite of Love, saying no one else in the world could have done them. I don’t hear that song the same anymore – all I can hear are those truly incredible multi-tracked backing vocals. Another Lou-Iggy-David tidbit – in a French documentary we got the chance to see this summer, a very-1973 Lou says something like “Yeah David, he’s fun. Pretty quiet, but when he drinks, he thinks he’s Iggy”. 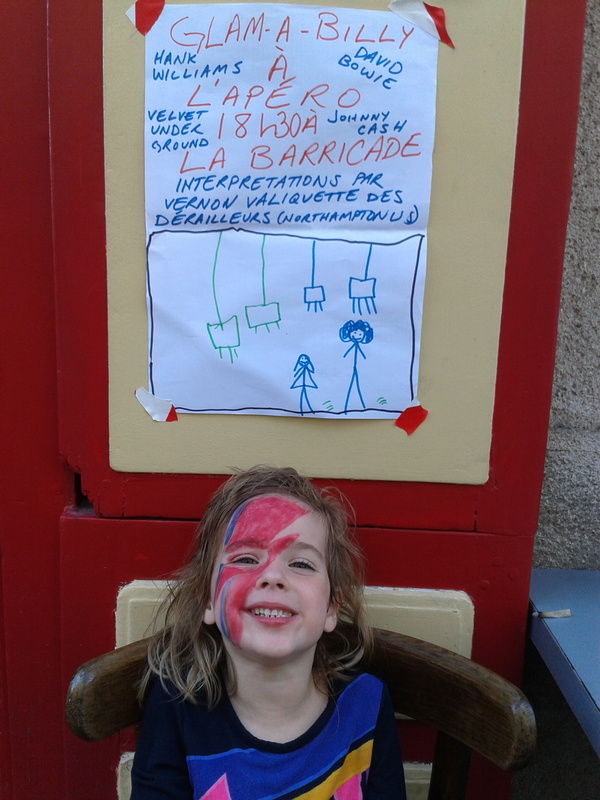 The next event in my year of Bowie was that “David Bowie Is” was in Paris last year, and we went as a family. Hopefully that exposition will now tour in perpetuity, and you’ll all get a chance to see it. Thanks to that, and subsequent events, our five-year-old thinks David Bowie is cool, which is pretty great. 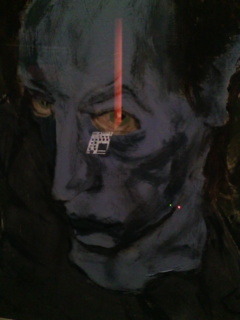 I snapped the photo below, which is Bowie’s Berlin-era painting of Iggy, with the synth that Eno gave him accidentally reflected beneath his eye. In the interview in the movie I just mentioned, Bowie said that he felt that he never had any talent for anything, except for perhaps painting, that he had to work very hard at music. I found that incredibly inspiring. One thing that I’ve gotten out of the all the Bowie information from “David Bowie Is” and O’Leary’s blog is an appreciation for how his music in the Berlin era (Low-Heroes-Lodger) was such a conscious and interesting blend of American soul-funk and European electronic music. This is reflected in the make-up of the band: Americans Carlos Alomar, Dennis Davis, and George Murray, and Europeans Brian Eno and Robert Fripp . Check out this concert video that my friend Lisa Samuda shared with me of Heroes-era Bowie. I tend not to like busy drumming, but I can listen to Look Back in Anger from Lodger over and over again just for the drumming. I also hadn’t realized how big of a role his collaborators played – he would apparently often just give them a very rough sketch of songs, and they would flesh them out on their own. The fact that Tony Visconti, Mick Ronson, Carlos Alomar, and the others did such a fantastic job on arrangements is a large part of the reason that his pre-1975 rock and post-1975 post-rock is so great (speaking of post-rock, a quick and too-reductive way of saying what his new album sounds like is Bowie singing with Tortoise, with some fancy contemporary vocal effects thrown in). But the singing on those records is to my mind what really makes them timeless. He has this inimitable way of changing styles and timbres in a seamless way within a song that he uses to great effect in Low through Scary Monsters especially. (Postscript: I just noticed the Apple Music Bowie Berlin collection says he was “exploring” new wave in this era. Inventing would be a better word). Seeing the Bowie documentary at the Art Rock festival at the beginning of last summer was a revelation to me on a number of levels. They had great interview with him, from about 1980 or a little later, in which he seemed confident and happy, and was reflective and funny. This contrasted with the image of him that was painted from the 1970s. He was a natural introvert, and the sudden Ziggy fame took its toll. There was footage of him post-concert in the Ziggy era, looking nervous and wanting to leave. It’s easy to imagine that the cocaine problem he developed was due to his using that drug to ease the interactions he needed to engage in. By the time of Young Americans he was a mess (that tour footage is frightening, and not very good – the David Live album from that time is also pretty painful). Besides his comment about having to work hard at his music, another thing that really stuck with me from that film was something he said about believing that our future is ours to invent. Right after seeing that documentary, I decided that I would play at the Fête de la Musique, the French national holiday on June 21st. All year I had tried from time to time to find collaborators so that I could play in it, and since I hadn’t gotten anything together, I had given up. But that documentary got me fired up, and I decided I would do a solo show. All the Bowie stuff made me also decide to invent a persona and genre, so Vernon Valiquette and Glam-a-Billy were born. Through a great stroke of luck I got to play in one of Nantes’ coolest bars, and Marie got into the act too, with poster design, roadie-ing, and dancing. I played a bunch of covers, mostly ones I knew from learning to sing and play guitar in my teens, including Ziggy Stardust. Listening to it now, I don’t think it’s that great – it’s really hard to do a Bowie song justice – but I was glad to have made it through it. That day was a dream come true, and it’s thanks to David that I had the courage and inspiration to pursue that dream. I went on to (re-)learn another Bowie song that I’ve played in a couple subsequent Vernon Valiquette shows, Watch that Man. We had played this song in our high school band, the Slinks. I knew the chord changes were complicated, but I hadn’t quite appreciated how hard the vocals were. This is what I said in Facebook at the time: “Turns out that Watch that Man is really, really hard, especially to sing, even an octave lower than Bowie. It’s got two key changes, and the vocals come in with the instruments on the changes. Man, did we ever torture our singer!” I told “our singer”, Gord Downie, that I had been playing it again, and he told me that he had covered it in his current band The Tragically Hip in a tour when they were learning a new cover every day and playing it in the encore (unlike me, those guys are real musicians). Humbling. Anyway, here’s my version. I wasn’t surprised to get the news today of his death. There had been rumors of his ill health, and his recent productivity, including his participation in the “David Is” exposition, had the feeling of someone wanting to leave the right final mark on his heritage. And he certainly managed to do that, though his impact had already been enormous. As for me, I’m sure that my songwriting tricks mostly come from David Bowie (playing an F chord in a song in A, for instance). He’s also a huge inspiration in the importance of collaboration and how to do it successfully. But the biggest mark he’s made in my life is by making music that I will never get tired of listening to. Thank you David. This entry was posted in Uncategorized on January 11, 2016 by Joe Pater. I’ve been finger drumming for about a year and a half now, and it’s so much fun and so useful that I can’t believe I’ve never seen anyone else doing it in public. By finger drumming, I don’t mean tapping your fingers on a desk. I mean hitting something with your fingers that produces the sound of drums. While it may not yet be a visible craze in the streets, you can see lots of kids on YouTube finger drumming on phone apps along with songs, and many performers finger drumming on samplers. I play mostly on apps on my iPad or iPhone, and have passed many hours playing and practicing drums while sitting on a park bench, in cars, trains and planes, in offices waiting for appointments…. There’s never a wasted or dull moment when you have drums in your pocket! In the cause of spreading this joy, I’m writing this post and making the videos below to tell and show you what you need to know to start finger drumming. I’m including some basics about rhythm in music, so that even if you’ve never played any other instrument, you should be able to start finger drumming. Musicians should be able to get something out of this too. Even though I’ve been playing music since I was a teenager, I’ve learned a lot through finger drumming. In particular, my time has improved immensely, which has affected my guitar playing, my keyboard playing, and especially my drumming. I was away for the last year, and didn’t touch physical drums, but I noticed a huge improvement when I got behind a drum kit again, and so did my friends playing with me (I’ve still got a long way to go, as you can tell in my finger drum videos). Finding a place to practice can be a major impediment to learning real drums, and even electronic drums can make a fair bit of noise. While there are many things you can’t do on finger drums that you can do with all four limbs, I can say from personal experience that the sense of time, as well as understanding of rhythmic patterns that you can develop in finger drumming, does transfer. Developing these abilities requires a bit of attention, so the material below may well be useful even to other finger drummers. As I mentioned, I do most of my finger drumming using iOS apps. 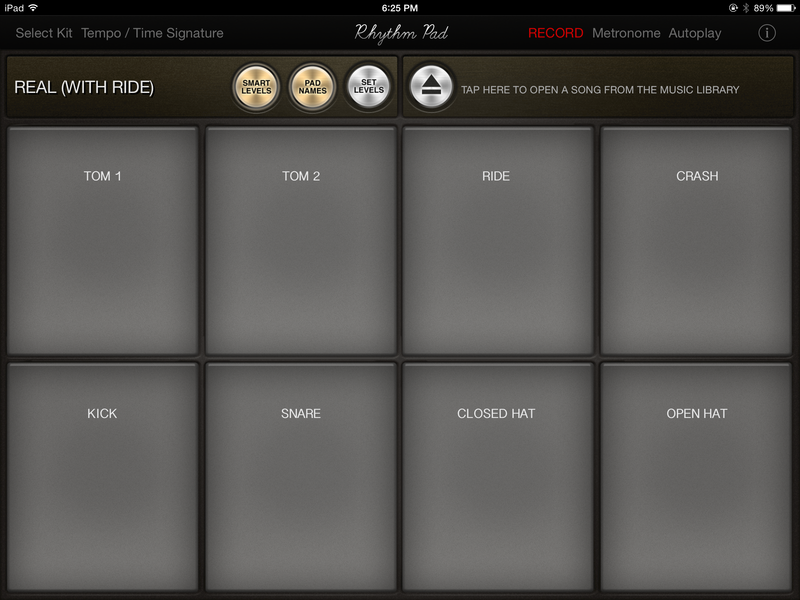 A lot of the available apps have you hitting images of a drum kit, which forces you to play Twister with your fingers. Way better is an app that uses images of pads, as on a drum machine or sampler. My favorite is Rhythm Pad, pictured at right. There is a free version, and getting rid of the ads only costs $2.99. It uses most of the screen space for the pads, and has the pad assignments in what are the right places for me (you can perhaps read them in the screenshot – if not check out the second video below to see what I mean). I worry that Android users may be out of luck – I’ve tried a few apps on a couple different phones, and I found them unusable because of the lag between tapping and sound. 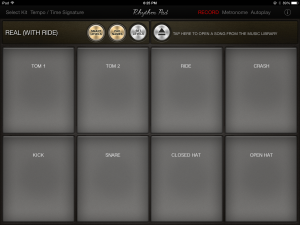 There are lots of physical pads available for i-devices and computers, which can be used to trigger lots of drum synths and samplers – finger drumming can open a pretty vast universe of musical possibilities. And conversely, musicians using samplers can stand to gain a lot by learning some finger drumming. Before you get started (finger) drumming, you need to know some basics about how songs are rhythmically structured. Everyone’s heard a song being counted in as 1-2-3-4. I’ll explain what those numbers mean, and how the spaces between can be further divided by 2, 3, and 4. I’m limiting myself to patterns that can be counted in 4, but that includes probably 98% of the songs in the rock-pop-r&b etc. tradition – it’s probably more like 85% in country, which uses more waltz time, which is counted in 3. I won’t use any standard musical notation, but I do think the step notation of a drum machine, as well as the audio illustration it provides, is very helpful in understanding and internalizing these concepts, so I’d encourage you to check out the video, which illustrates these ideas on a software drum machine (the drum machine itself, DM-1, is also worth checking out, especially on the i-Pad, even though it’s got its pads in the wrong places for finger drumming, as well as some other limitations). In the 4 count, which indicates one repeating bar or measure, you’ll usually find a bass drum on 1 and 3, and a snare on 2 and 4. The 1 often gets special emphasis, with a stronger bass drum hit, a crash cymbal, and a roll leading into it. A good place to start learning is to listen to music and identify these four beats and play along with them. You’ll sometimes hear music without the bass and snare on these beats – reggae music famously often drops the 1, and funk syncopation can move everything except the 1 – but most of the time they’ll be there, along with other cues for the 1. The bass and snare drums, as well as the rest of the drum kit, other instruments and voices can also fall on the positions between the beats that are created by dividing that space in 2, 3, or 4. In the accompanying video, I illustrate the divisions between the beats with a hi-hat, and also show some of the patterns that result from permutations of bass and snare on the various positions. The simplest hi-hat pattern is just to play on all four of the beats. A more common pattern is to play the hi-hat in 8, hitting everything counted in 1-and-2-and-3-and-4-and, so that there is a hi-hat between the bass and snare as well as played with them. A “straight” 8 pattern will divide the space between the beats evenly in 2. An inter-beat division into 4, such as playing 16 on a hi-hat, is often used in slower music, in disco music, and as I’ll explain momentarily, in syncopation. The division into 3 (or triplets) is mostly used in jazz, blues or early rock and roll styles, in what are called swing or shuffle beats, though it’s not at all uncommon in even contemporary electronic music. Divisions into 3 are usually written in standard music notation as 6/8 or 12/8, though they can also be represented in 4/4 with triplets. As the examples of swing and shuffle bring up, not all of the positions in a 4, 8, 12 or 16 step division necessarily get played. A blues shuffle would have the high hat playing only 8 of the 12 steps, with the hit between the beats later than in a straight 8 – on the “uh” of 1-and-uh-2-and-uh-3-and-uh-4-and-uh. In other words, a straight 8 and a shuffle 8 have the same number of hits, but the one between the beats comes later in the shuffle. As Alexander Stewart discusses in a very useful piece in Popular Music, the transition from early r&b and rock&roll to later funk and rap involved a transition from predominantly swing/shuffle beats to predominantly straight ones. As Stewart also discusses, the shift to straight 8 allowed funk to use the 16th divisions between the 8ths. This is called syncopation – hitting unexpected points in a measure. Finally, Stewart’s discussion of funk brings up a point that is important to emphasize here: there is a lot in human rhythm that is not well captured either by drum machine step notation or by standard music notation. Funk drummers can play with a slight lag on a hit to introduce a degree of swing to the rhythm. Drum machines simulate this with a “swing” control, and music notation uses diacritics, but to really understand it and feel it, you need to listen to drummers and play. But if you’re just starting, don’t worry about syncopation, or playing behind the beat – just focus on staying in time on the beats, which is hard enough. Drum teachers often emphasize the importance of starting simple and slow so that you can develop your sense of time. Even playing the simplest pattern in time at a moderate tempo is difficult at first, and apparently the key to playing complex and fast things well is to build up to them gradually. Playing with a metronome is an excellent way to work on time. Justin Aswell gives some good general advice about finger drumming (rule number 1: relax! ), and shows what professional finger drumming looks like. How fast you progress will depend on your previous experience, and perhaps also on innate ability, but I would guess that just learning to play a simple alternating bass snare pattern with a hi-hat in 4 perfectly in time should generally take at least a couple of weeks. Playing that pattern fast is an infinitely difficult challenge, insofar as there’s no limit to how fast we can play (which there probably is). I think it will help if you can take pleasure in getting each small new thing right, rather than hoping to jump quickly to some level of virtuosity. Note that you can play even the simplest patterns along with recordings, which might make it more fun. Personally, I prefer just playing with the metronome, and find that it’s plenty of fun just trying to do that well, and gradually adding in new challenges, and inventing and learning new patterns. The clip below breaks down a rhythmic pattern into its parts, and will hopefully be useful in seeing the kinds of things you should be trying to get your fingers to do. Once you’ve digested what’s on this page and in the videos, and have got the basics down, I think you’ll find that you can keep learning more by just listening to music, and by looking at various (finger) drum tutorials. There are lots of better drummers than me, finger and stick, out there willing to give you advice! Please let me know if this has been useful for you, and if you have any related thoughts or particularly useful materials you’ve come across. Hewitt, Michael. 2008. Music Theory for Computer Musicians. Boston, MA, USA: Course Technology. Less accessible, but invaluable, was the Alexander Stewart article on the history of American rhythm I linked above. Here it is again. Finally, if you happen to be a linguist, you’ll likely enjoy these Language Log posts by Mark Liberman on the basics of text-to-tune mapping, and on its interaction with rock syncopation. This entry was posted in Uncategorized on August 28, 2015 by Joe Pater. 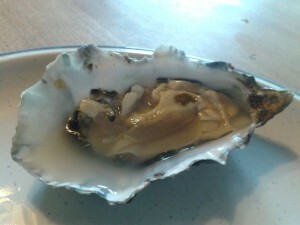 Best oysters in the world? I haven’t tasted enough oysters to make a confident claim of supremacy for these ones, but they’re certainly as good as any others I’ve ever had, and better than many. The brine is quite salty compared to some others, and the flesh is sweeter. 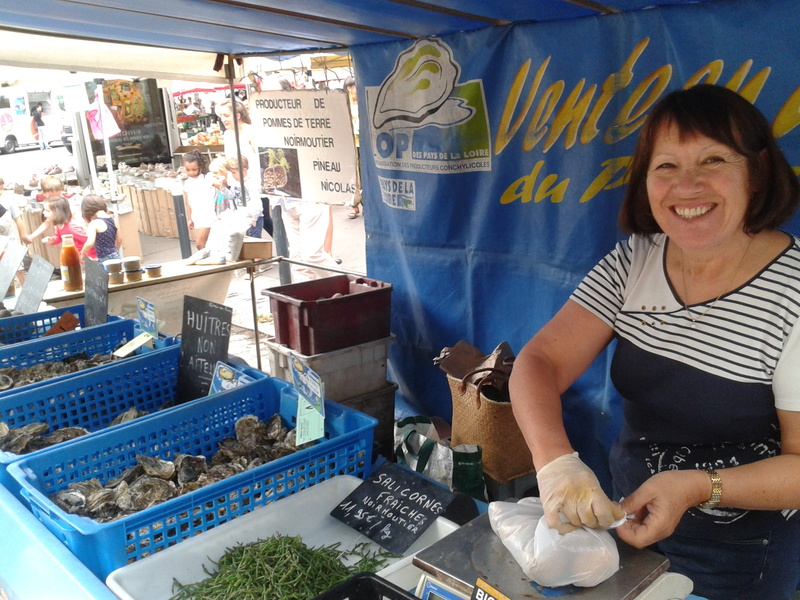 They come from Noirmoutier, and are sold by their producteurs, the Pineau family, in the Boulevard des Américains market Tuesday mornings in Nantes. That’s Françoise Pineau in the picture, who nicely answered the questions I often had about her products. My weekly ritual for a while now has been to get a dozen and open them up for lunch right away (thanks to Pierre for teaching me how to open them!). The salicornes that you can see in the front of the photo are also delicious, as are the mussels, the coques, and the famous Noirmoutier potatoes. I’m looking forward to tasting other oysters elsewhere, which will certainly have their own merits – the notion of “best” here is ultimately silly, of course – but I know I’ll now always have these as a référence. This entry was posted in Uncategorized on July 8, 2015 by Joe Pater.